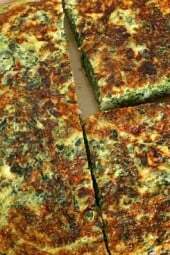 Spinach, scallions, feta and eggs make a fabulous, light breakfast frittata or for a low carb lunch serve this frittata with a Greek salad on the side. Other frittata recipes I love are Light Swiss Chard Frittata, Mushroom Shallot Frittata and Caramelized Onion, Zucchini and Red Pepper Frittata. To make this low fat frittata I’ve replaced most of the eggs with egg whites. For convenience I usually buy Trader Joe’s cage free liquid egg whites, but you can use Egg Beaters or separate them yourself if you prefer. When buying parmesan cheese, I like to buy Parmigiano-Reggiano, it has a sharp, strong-flavored, nutty taste. Inferior versions of parmesan can have a bitter taste. Squeeze all water from spinach. In a 9 inch non-stick sauté pan, heat olive oil over medium heat. Add the onion and scallions and cook until soft, about 4 minutes. Meanwhile in a medium bowl, beat the eggs. Add salt, pepper, cheeses and spinach and mix well. Pour the mixture into the skillet and cook until the bottom sets, about 5 minutes. Hold a large plate over the pan and invert the frittata onto the plate, then slide it back into the pan. Cook about 5 minutes longer. Serve hot. I didn’t have frozen spinach so I used a 10 ounce bag of fresh spinach. (Forgot to make sure it was triple-washed–argh! It wasn’t and my husband got some dirt.) To get the water out of the spinach, I warmed it gently in a large, heavy covered pot, then squeezed the water out. Also, when most of the frittata had set in the pan, I spriinkled the Parmigiano-Reggiano on top, and put it under a broiler for 4-5 minutes, watching carefully so as not to burn it. It should freeze great tightly wrapped. Made this last night and it was delicious! Way easier than I thought it would be, too! I am researching more fritattas I can make LOL. This is perfect to take for lunches, it packs nicely and looks pretty fancy too 🙂 I made it in my cast iron skillet and it came out perfectly! I sprayed a little cooking spray before pouring the eggs in and I had no problems with sticking. This was amazing for how little calories it had and endlessly cystomizable. Thanks Gina! Could I use this recipe but bake in the oven like I would a quiche? I don’t understand the spinach ratio. I added 10 oz of frozen chopped spinach, thawed and it was WAY too much. Maybe with fresh spinach 10 oz would work but not frozen. If I make this again I will is way less or measure frozen and then thaw. I don’t mind using the whole egg. How many would I use if using all the egg? Has anyone calculated the Smart Points for this recipe yet? Thanks! This was delicious! Although inverting it is quite impossible I find. Mine ended up being more of a scramble, which is fine. Next time I will make it in a oven safe skillet and bake instead. Made this for my hubby & I. I made a full egg version for him (8 eggs + a splash of egg whites) & the lighter recipe version for me. It was a little hard to flip the frittatas using a plate. The frittata was largely liquid on top so it tends to make a mess unless you do it perfectly. Since I was making two, I tried a different method when cooking my version by cooking in the pan for 5 minutes & then put it in the oven on a broil for a few minutes to set the top. PERFECT! Now we'll have leftovers all week 🙂 Delicious recipe! Ah, I'll try this next time, mine came out messy as well. I came here to ask Gina how she made hers so perfect looking. It was delicious though, Gina! Now I've made this recipe, your broccoli and cheese stuffed chicken, and your Czech crepes with berries and cream. Every one absolutely delicious. Made this for brunch today and followed the recipe exactly. It was delicious! adding this to my xmas brunch line up but going to bake them in muffin cups. for easy self serve. and Im serving your pumpkin oatmeal cookies. (Gluten free for us) thanks! I made this yesterday, having never made any kind of frittata before. It's not hard to make and ridiculously good. I am always looking for healthy things to bring to work (so I don't end up buying a tuna melt or something), and this is a perfect make-ahead meal. Gina, you are my hero. Thanks so much! 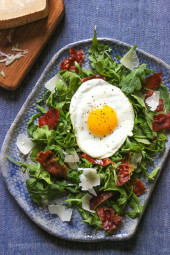 I just made this yesterday for brunch and am enjoying the leftover for breakfast today! Thanks so much for your great recipes! I made this with fresh spinach and didn't do the flip method – i just popped my skillet in the oven after a couple minutes on the stove, and it turned out great! She probably has us invert it because she says to use a non-stick pan… most of which can't go into the oven to finish. I'm trying it right now in a skillet that can finish in the oven. Fingers crossed! If I want to use egg whites instead from the carton how many cups would it be? Ok, I think I cracked the code on this. After making it twice and both times having it make a disaster at the flipping stage (first time it was editor, secondit was not) it tried again today and was successful. First, it worked much better using real egg whites from real eggs, versus using the carton of refrigerated egg whites. Those are too watery. Second, after about eight minutes on the stovetop I popped it into 350 degre oven for about 15 minutes and it came out perfect! The top didn't brown so if you want it to look crusty you could flip it and brown the top or just flip it before serving it. It is really a delicious recipe and definitely worth trying! Okay Gina, I'm still swooning from your Chicken and White Bean Enchiladas with Creamy Salsa Verde…(yum, yum, yum!!!) from two nights ago. 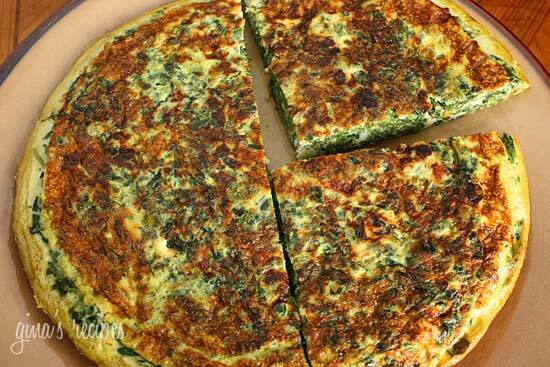 Now, this yummy frittata that I have all the ingredients on hand…thank you Gina. You completely ROCK! Lunch is on!!! Okay, I did something wrong. The bottom set beautifully, and I double checked to see that you HAVE TO invert this. So I did, and it made a colossal mess. Runny egg and spinach ended up on my hot burner. You can imagine the smell. I feel like it would have been overcooked if I had waited for the top to set, which I don't think it will on the stove. Has anyone tried finishing this in the oven? I'm sure it will end up delicious but if it makes this big a mess I'm not sure I will attempt it again. Could I use ricotta instead of feta? Would it be good do you think? PS Your website is amazing! If you live near a Trader Joes – they have outstanding light feta. It is only 40 calories and ounce and tastes fantastic. I used a bit fresh baby spinach (definitely not 10 oz) in place of the frozen, and it came out great. Thanks Gina! Yes you do have to, the directions say to invert it so it cooks on both sides. Question: Do you have to invert this frittata? I know in your other frittata recipes you just stick the whole skillet in the oven without the flipping. Is there a reason this frittata should be flipped? Awesome site!! I don't do WW either, but who cares….your recipes look amazing! Your site is so organized and you take great pics! Thanks!! I plan on visiting often! amazing! i used frozen brussel sprouts and put them in a food processor – instead of spinach. it was delicious! thank you! I made this and it was delicious! Thanks for the recipe. I posted about it on my blog. Come check it out! Making this tonight, and will wing amount of spinach. For next time, though, what size package do you use? By the way, I've been making recipes off your site now for a while, and have been so pleased at how yummy everything is! The fact that you figure out the ww points, etc., is such a big help! That's wonderful! It's nice to see even those of you not following points are visiting. I’m sure fresh spinach was great! I love this with reduced fat swiss cheese too! 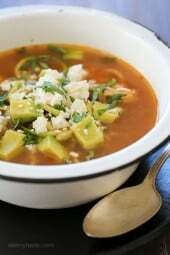 I tried this tonight, but swapped out the feta for 2 oz. reduced fat cottage cheese and added 1/2 c cherry tomatoes..it was soooo goood! Rico!!! 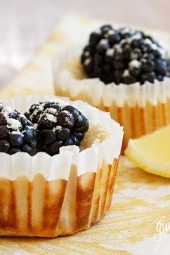 Very good, losing weight can be very pleasant using your recipes, thanks a lot! That sounds really good! I might have to make that this week.. maybe tomorrow. Oh goodness when is dinner? That looks so darn good Gina. Thank you!